The recently completed Steel Winds wind power project in New York State was unique in that it was located on a brownfield site and it marked the first commercial deployment of Clipper Windpower's new 2.5 MW Liberty wind turbines. The Steel Winds wind farm in upper New York State represents a unique alternative energy project: the melding of new technology-including a new generation of 2.5 MW wind turbines-with a site with a rich industrial heritage, dating from America's Industrial Revolution. That was even reflected in the ceremonies that were held to start construction of the wind farm project; rather than a "ground breaking" ceremony, UPC Wind and its partner, BQ Energy, held a "slag breaking" ceremony, acknowledging the site's steel-making history. Located just south of the city of Buffalo, in the suburb of Lackawanna, the 20 MW Steel Winds project is on a 30-acre portion of the former Bethlehem Steel mill works, on the shore of Lake Erie. While Bethlehem Steel is no longer around today, it was once the second largest steel manufacturer in the United States, and a symbol of America's industrial might. The Steel Winds project, along with the dozens of other wind energy projects being built and planned in the United States, could now easily be viewed as a symbol of America's increasing might in wind power. The Steel Winds project with its eight turbines is on a 30-acre portion of the former Bethlehem Steel mill works site, on the shore of Lake Erie. UPC Wind president Paul Gaynor says the company is pleased to bring alternative energy-in a high profile way-to this part of New York State. "The fact that Steel Winds is so close to Buffalo is great," he says. 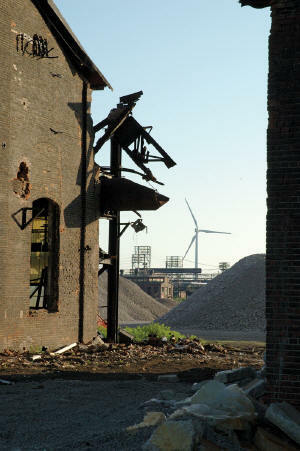 "I don't think there's another wind farm of this scale that's as close to a major urban center. You can't miss it when you're driving through Buffalo-it's getting a lot of attention." Wind farms in the U.S. are almost all built in rural areas, Gaynor notes, even though the power generated is often consumed in the major cities. These kinds of higher profile projects are what the industry needs, he says, to give city dwellers the opportunity to see what wind farms are all about. "Wind farms are located where the best wind is, and that's often far away from the urban centers," says Gaynor, citing UPC's Mars Hill Wind Farm project in Maine. "That project is pretty far away from New England's major urban areas." But Steel Winds, now up and operating, is giving wind power front and center exposure. In addition to its location, the fact that that UPC Wind and partner BQ Energy were working with a brownfield site-rather than a greenfield site-posed some challenges. But these were more than outnumbered by the advantages of working on an already developed site. BQ Energy, of Patterson, New York, has a strong focus on developing wind energy on brownfield sites, such as those used for steel mills and oil refineries. BQ Energy worked on developing the concept of a wind farm on the Steel Winds site with the site's owner, Mittal Steel, and the city of Lackawanna. UPC Wind entered the picture in 2006, when BQ Energy was looking for a development partner, someone who brought expertise in supplying capital, sourcing equipment, and construction. Currently, UPC Wind has three wind farms in commercial operations with over 3,000 MW in development, from Hawaii to Maine, but this project is unique, says Gaynor. "I'm pretty sure Steel Winds is the only wind farm on a brownfield site in the United States," he says. "It's a great location to put wind turbines, not only because of the wind resource right there on Lake Erie, but the wind farm itself takes up very little space on the site." And it makes good use out of what was largely undeveloped acreage. Due to their history as homes to heavy industry, there are usually a limited range of development options for brownfield sites. "Steel Winds is a good fit for the site-it makes a lot of sense." Was UPC Wind's approach to the project different from its other wind power projects? "Absolutely," says Gaynor. "The biggest thing is that as owners of the wind farm, we could be liable for any pre-existing contamination issues." The New York State Department of Environmental Conservation, working with the EPA, addressed this, providing the company with indemnities for pre-existing conditions on the site. This was crucial, says Gaynor. "If we had been unable to get those indemnities, it's pretty clear we would not have gone forward with Steel Winds. It gives us assurances that we won't be hit with a lawsuit regarding any pre-existing conditions. "That's the big difference from our other projects. Most of the wind farms we have or are looking at are in rural areas, on farm land, and there are no contamination issues present." Pre-surveys were done to select the best locations for the eight Clipper Windpower 2.5 MW Liberty series wind turbines that make up the project. The turbine locations were selected both for their good wind power-the turbines and towers are 150 to 200 feet from Lake Erie, and the strong winds coming off the lake-and because they are away from the more contaminated areas on the site. "The brownfield site had been surveyed so we knew where to stay away from," says Gaynor. There was a very strict protocol in carrying out the construction work, Gaynor explains. "If we did come across anything, there were strict procedures that had to be followed. I think there was someone from the Department of Environmental Conservation on site just about every time we sunk a backhoe bucket into the ground." Once the excavation was done, and the concrete for the turbine sites poured, construction of the project was "pretty straightforward," says Gaynor. Tennessee Valley Infrastructure Group of Chattanooga, Tennessee, which specializes in renewable energy project construction, was brought on as the contractor on Steel Winds. Gaynor adds that even through it is a brownfield site, and that they were re-habbing the site, they still had to go through the same permitting and approval process. There were all the local permitting steps and hurdles, just as if it were a greenfield site. "It might be a more compelling story because we're rehabbing the site, but you still have to go through the research, site investigations, bird studies, sound studies, visual simulations-just like a greenfield site. That part of it remains the same." A big bonus is that because of the site's former use as a steel mill, there was plenty of power transmission infrastructure already in place, including an already existing sub-station. Some work was required on the electrical infrastructure, notably in the transmission evacuation, but the existing system by and large, was a very attractive feature of the project. And the site has a deep port, which allowed the offloading of the huge blades, which were shipped from Brazil, right on site. "Being able to do that is extremely unusual, but it was a real benefit." Some clearing work had to be done for roads, but, for the most part, the site is well serviced. "We could literally drive the trucks with the turbine towers off the highway and right onto the turbine pad." All this said, Gaynor admits that, understandably, there was some initial hesitation on UPC Wind's part to go forward with a wind project on a brownfield site. "It took us a while to get comfortable with the fact that we had the indemnities, and that we weren't going to be libel for any pre-existing conditions. Because it had not been done before, we had to do quite a bit of legal research and talk to a lot of people to get comfortable with the project." There were a couple of compelling reasons the company decided to move ahead with the project. "It's in New York State, and that's a relatively important focus state for us as a company. We want to use Steel Winds as part of our platform in New York State." The state could see significant growth in wind power in the future. Earlier this year, New York Governor Eliot Spitzer announced a comprehensive energy plan that focuses on energy efficiency, conservation, and investment in renewable energy sources as the keys to achieving economic and environmental goals.
. proposed power plant siting legislation that creates an expedited review process for new wind power projects. According to the American Wind Energy Association, the state has total installed wind capacity of 370 MW-but it has potential output of a staggering 7,080 MW, leaving plenty of room to grow. New York State also has a Renewable Portfolio Standard (RPS) requiring that 25 percent of electricity comes from renewable energy sources such as wind power by 2013. UPC Wind was also looking for the opportunity to try out Clipper Windpower's new 2.5 MW Liberty wind turbines-Steel Winds marked the first commercial deployment of the new turbines. They are said to be the largest wind turbines assembled in the U.S. The turbines are designed to mitigate loads to components found in many multi-megawatt wind turbine designs through Clipper's patented Quantum Distributed Generation Drivetrain and the use of four unique permanent magnet generators. Proprietary variable speed technology also enables operation in a simpler, more efficient manner than standard wind turbine technologies, says the company. Grid integration is achieved through power factor regulation technology with ride-through capability which exceeds current and planned standards for electric grid operation; a two-ton on-board crane simplifies maintenance to significantly reduce service-related costs. The 2.5 MW Liberty turbine installation can be accomplished with a crane sized for standard commercial 1.5 MW units. The turbines are assembled at the company's relatively new plant in Cedar Rapids, Iowa. Gaynor says the company wanted to develop a business relationship with Clipper Windpower, and Steel Winds offered the opportunity to try out the new Liberty series on a smaller project. "We're excited about using the Liberty wind turbines," says Gaynor. "The Liberty is among the largest land-based wind turbines in the world and provides economies of scale, allowing greater electrical capacity to be installed with fewer wind turbines. "We believe the industry is moving towards a larger more efficient machine and the Clipper team is ahead of the curve in this regard." The relationship between UPC Wind and Clipper is now off to a good start, and UPC Wind has purchased further Clipper units for other projects. In addition to Clipper's manufacturing and servicing capabilities, the size of the Liberty turbines themselves was clearly appealing to UPC Wind. "In our view, the landbase platform in the industry needs to be bigger than the one MW to 1.5 MW class, to be competitive, especially on some of the sites in our portfolio," explains Gaynor. "With Steel Wind, we were looking at putting in eight 2.5 MW machines versus 13 or 14, 1.5 MW turbines. To us, the economics are pretty compelling. We're getting another MW out of each and every unit. " The Liberty turbines themselves are not a lot bigger, he adds, though the blades are. They are using 96-meter rotor blade diameters versus a 77-meter or perhaps 80-meter diameter they would have gone with for smaller setups. The towers, supplied by Aerisyn LLC, of Chattanooga, Tennessee, are 80 meters high. Opting for 2.5 MW turbines is especially attractive on some sites with geographical limitations, such as ridgelines. "Steel Winds is a good example of that," explains Gaynor. "We are limited to having eight or nine turbines on the site, and if we were using 1.5 MW turbines, we'd be talking a total 12 MW project versus a 20 MW project. That's a big difference." Even though UPC Wind now has one brownfield wind farm under its belt, so to speak, and has gone through the learning curve, brownfield projects will not receive any more attention than conventional wind farm projects from the company. "Brownfield sites are an interesting concept, but we evaluate projects on an individual basis," says Gaynor. "Would it make sense for us to do another brownfield project or is our capital better deployed on a greenfield site? You don't know until you see the specifics of the project. But we wouldn't favor a brownfield site over a greenfield site at this point unless there were some extenuating circumstances." And even though the wind power industry is developing at an extremely rapid pace-with companies snapping up optimum sites-there still seem to be plenty of greenfield sites for UPC Wind to choose from for the foreseeable future.